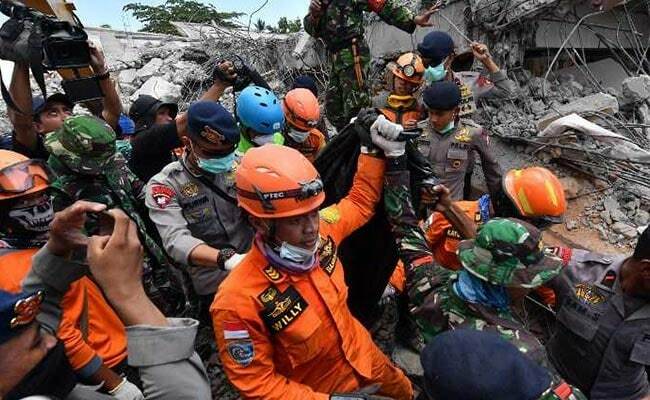 Sutopo Purwo Nugroho said the emergency response period has been extended another 14 days, which would allow authorities to deal with the problems. An earthquake on the Indonesian island of Lombok has killed 387 people, authorities said on Saturday, adding hundreds of thousands of displaced people were still short of clean water, food and medicine nearly a week on. The shallow 6.9-magnitude quake Sunday levelled tens of thousands of homes, mosques and businesses across Lombok, just one week after another tremor surged through the island and killed 17. "It's predicted the death toll will continue to grow because there are still victims who are suspected of being buried by landslides and under rubble, and there are victims that have not been recorded and reported to posts," national disaster agency spokesman Sutopo Purwo Nugroho said. The number forced from their homes in the disaster has soared to 387,000, Nugroho said, with around 13,000 injured. The hardest hit region of Lombok has been in the north, where 334 people have died and nearly 200,000 have been forced from their homes, according to latest official tolls. Two people were also killed by the quake on the neighbouring tourist island of Bali. Nugroho said the emergency response period has been extended another 14 days, which would allow authorities to deal with the "many problems" that still existed in the field. Most of the displaced are sleeping under tents or tarpaulins near their ruined homes or in evacuation shelters, while makeshift medical facilities have been set up to treat the injured. Six days after the quake hit some evacuees have still not received assistance, particularly in the mountainous north of the island. "The main problem is the distribution of supplies to thousands of refugee points," Nugroho said. "Most of the roads in North Lombok were damaged by the earthquake." Survivors of the quake have been shaken by hundreds of aftershocks, including a shallow 5.9-magnitude quake Thursday which caused people to flee evacuation shelters crying and screaming.